While out and about this week, watch and see how many people say “thank you” for the little things others do for them. What about children? Do kids and teens say it without being reminded to do so? In today’s culture, thankfulness has gone out the window with other courtesies. “It’s all about me” is truly the mantra of most you meet. “ME 1st!” and “Thank you” rarely occupy residency in the same heart. When was the last time you actually stopped in the middle of the day and thanked God for something little? We were getting ready to go out the door the other day and I couldn’t find something I needed. As I went back to my room, I asked God to make it visible to my eye and I saw it immediately, not where it was supposed to be but I saw it nevertheless. Don’t assume anything is by chance or luck. Assume everything is by God and take the seconds of time it will take to thank Him for it. A few years ago I (Carla) was invited to be in a Thanksgiving-praise group with 4 other ladies. We often email each other a few things we are thankful for. The last several months, I have been taking the things that are tough to live with and turning them into a statement of gratefulness before our Lord and my friends. As many of you know in 2004 we were in a horrific car accident and I still suffer severe pain. As I was looking up at the ceiling the other night asking God for help to endure it, I decided I should find something about it that I am thankful for. What a difference this makes in my attitude. Showing thankful hearts on a regular basis leads to contentment, a blessing in itself. Why not start your own praise group with your children? With little ones, ask them to share one thing that makes them happy and ask them to thank God for it with you. This is something you can do around the dinner table. We would tell our kids they had to tell us 3 good things about their day before they could share anything they didn’t like about it. I remember our son, during his middle school years saying, “Here are the good things, now, here are the bad.” This made them realize good things happen every day. 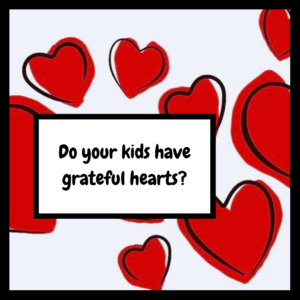 How can you teach your kids to have grateful hearts? You can cultivate grateful hearts by giving to others. Make cookies together for an elderly neighbor. When they invite you in, go in and (set this up before you get there) have your kids ask the older folks to share a story about when they were growing up. Think about doing this every few weeks during the coming year. What a blessing it will be to both of you. Ask your kids how they can show their thankfulness for all God has given them by giving to others. Come up with a few specific things and do them! Has Joey & Carla’s ministry been a blessing to you? Do you know they serve with a non-profit ministry and live on the donations of others? Would you consider sending a donation to assist them in their ministry to families? It is because of your faithful prayer and financial support the Links are able to continue helping families. Thank you for supporting the ministry of Parenting Made Practical!